Twitter Player Emojis: Twitter and Indian Premier League (IPL) have teamed up to release special player emojis for 30 popular IPL players. Fans can just tweet using the designated player hashtag and an emoji version of that player will automatically appear after the hashtag within the tweet. For example, when you put the hashtag in front of Virat Kohli, an emoji version of him will automatically appear after the hashtag within your Tweet. 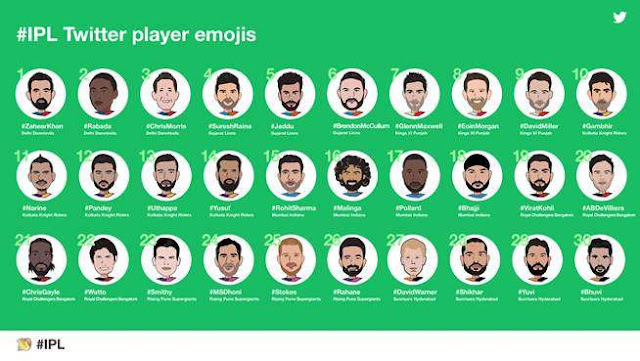 The Tweets with player emoji related hashtags will count towards the daily #IPL player Twitter battle showcased during the live broadcast of the game. There will be an exclusive emoji for the 10th season when fans tweet with #IPL.